Chicken Invaders 4 is not released yet. I get this funny message below when I try to access page chickeninvaders4.php at InterAction studios official site. Chicken Invaders 4: Ultimate Omelette. This page does not yet exist. You have arrived here as a result of a time paradox. Please go back immediately before you create a rip in the space-time continuum, starting a chain reaction that propagates through the galaxy and destroys all living things. This download (ChickenInvadersROTYdemoInstaller376.exe) was tested thoroughly and was found 100% clean. Click "Report Spyware" link on the top if you found this software contains any form of malware, including but not limited to: spyware, viruses, trojans and backdoors. Chicken Invaders 3 Xmas 3.76 - Dash across the galaxy to save Earth from the latest & greatest chicken threat! 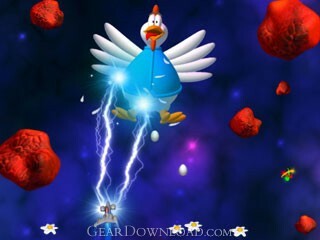 Chicken Invaders 2 2.90 - Save the solar system from invading chickens! Fast-paced action for 1-2 players. Island Wars 1.20 - Fight for supreme control of your palm trees! Fast-paced action for 1-2 players. Island Wars 2 2.74 - Two islands battle over their palm trees! Fast-paced action for 1-2 players. Island Wars 2 Xmas 2.74 - Two islands fight over their Christmas trees! Fast-paced action for 1-2 players. Loco 1.41 - Load passing trains with fruits & vegetables for Fruitopolis! Loco Xmas 1.41 - Save Christmas! There's a shortage of gifts. Load Santa's trains with presents! Piggly Xmas 1.22 - Have you ever seen a pig fly? Then you simply haven't met Mrs. Piggly yet. Chicken Invaders 1.30 - Save the earth from invading chickens! Fast-paced action for one or two players.